The Institute for Public Policy Research (IPPR) have released a report on the English Question with some very interesting results which show UKIP, once again, ahead of the curve on public opinion. The report concludes that there is unhappiness with the status quo viz the way the UK is governed and the way government has changed in light of devolution has resulted in an increasingly political representation of Englishness. Now, before I delve into the contents of this report I will recap on where UKIP stands on the subject of Englishness, Britishness, the union, devolution, the West Lothian Question and the English Question. UKIP has traditionally been a British nationalist party. There's a clue in the name: "United Kingdom Independence Party". However, there is a UKIP Scotland, UKIP Wales and UKIP NI so like the other parties, there is an acknowledgement that the UK isn't a nation in the traditional sense and that a federal structure of sorts is required to properly represent the electorate or at least to fit into the way that politics works practically. For a long time, UKIP policy has been to oppose devolution and promote the idea of Grand Committees of British MPs legislating for the nations they were elected in. In itself this demonstrates the somewhat incoherent and inconsistent British nationalism that has driven policy thus far - the belief that devolved national governments undermine the concept of Britishness and so should be replaced with British Grand Committees representing exactly the same geographic area. There is the EU element of course (well, it wouldn't be UKIP if there wasn't an EU conspiracy theory!) - there is still a prevalent belief that devolution is the work of the EU who want to break up the UK to more easily assimilate us. There is no doubt that the EU wants the UK to be broken up and they have worked hard to ensure regional administration puts down deep roots. However, the fact that Scotland, Wales and NI are both nations and euroregions has muddied the water understandably giving credibility to the theory that the EU was behind their devolution settlements. If the EU were involved in the devolution settlement for Scotland, Wales and NI it was to give consent, not as architects. So UKIP has, for many years oppose devolution based on the belief that it will undermine Britishness to the extent that the union will fall apart. Until, that is, Paul Nuttall's recent policy paper that outlined a new policy of supporting devolved government for all four member states of the UK. Which brings us more or less up to where we are now. 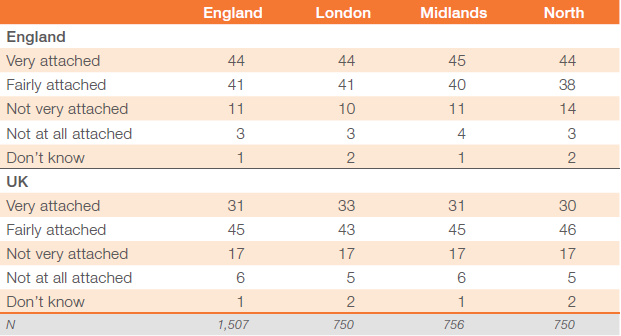 The IPPR report is the first major investigation into English (as English, not a subset of British) politics, national identity and English opinions on devolution and governance. So what did they find? Firstly, the English have changed their minds on the impact of Scottish and Welsh devolution on how the UK is governed from ambivalence to believing it has made it worse. IPPR attribute this change of attitude to the perception of disadvantage for England in a post-devolution UK. The opinion of around half of all English people polled was that Scotland benefits most from the union financially with the other half being unsure, thinking that both England and Scotland benefit equally and a very small minority thinking that England benefit most. Secondly, the proportion of people in England who think that Scotland should be independent from the UK has risen to 22%, equal to those who think it should be governed by a devolved parliament with more tax-raising powers and who think it should be governed directly by the British government. 19% think that it should stay as it is and 15% don't know. The number of people in England who think Scotland should have its own government with tax-raising powers - what is planned for Scotland - has nosedived from a high in 2001 of 53% with independence and don't know accounting for most of the difference. The number of people in England supporting a ban on Scottish MPs voting on English laws now that Scotland has its own government has increased remarkably since 2007. The number disagreeing remains very low. The report is reporting these figures as support for English Votes on English Laws which it isn't - the question specifically asks "Now that Scotland has its own parliament, Scottish MPs should not be allowed to vote in the House of Commons on laws that only affect England". Supporters of an English Parliament and elected regional assemblies would also express the opinion that MPs elected in Scotland should be banned from voting on English laws. 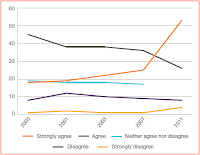 English people are quite unequivocal in their opinion of whether the British government looks after the interests of all parts of England equally - between roughly two thirds and three quarters of English people think that they don't. Even in London, which most English people think gets too much attention from the British government, 58% of people thought that the British government didn't treat all parts of England equally. An interesting statistic is the number of people who trust the British government to work in the long term interests of England. 42% have "not very much" trust in the British government to work in England's interests, 17% "not at all". On the preferred form of government for England, just over a third think that "English MPs" in the British government should govern England. 24% support the status quo, 20% support an English Parliament, 9% support regional government and 14% don't know. While this does appear to show support for an English Parliament quite low, the option for "English MPs" is misleading for most people. They aren't "English MPs", they're British MPs elected in England - an important distinction because "English MPs" implies an English mandate. More on this in a moment. When excluding an English Parliament, an overwhelming number of English people believe the British government has and should have the most influence over the way England is run. 27% of English people believe the EU has the most influence over how England is run yet only 1% think that is right. 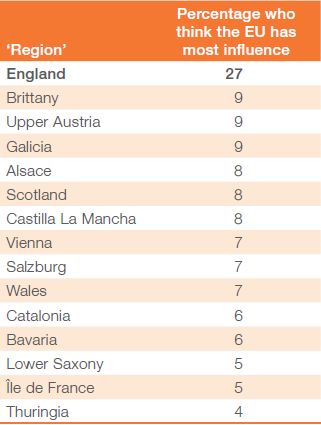 The report compares the number of people in England who think the EU has the most influence against other "regions" of the EU as a measure of euroscepticism which shows that England is by far the most eurosceptic - far more eurosceptic than Scotland where only 8% think the EU has most influence over their country. However, this isn't really a measure of euroscepticism, it's a measure of how many people think the EU has most influence over their "region". It is natural that such a large number of people in England would think that the EU has most influence for two reasons: English people are generally more eurosceptic than most and because every other "region" in the list has its own devolved government which makes most of the decisions that affect their day to day lives (notwithstanding the fact that most of those decisions are covered by EU regulations, a fact that is sadly lost on most people). Going back to the preferred method of government, there is an inconsistency in public opinion depending on the question asked. Asking for an outright choice of a form of government produces a markedly different outcome to asking who should have most influence over the way England is run when the answer is an English Parliament. This shows how important the question asked is - people are turned off by politics and not many people really understand the often subtle differences between different forms of government. When forced to choose a national identity between England and British, English is now the majority choice and the trend over the last couple of years is for a very rapid increase in the English identity. Last year's royal wedding saw the country draped in British flags and the British Olympics are almost permanently in the news. The British government and the BBC in particular have used both these events to try and promote their Britishness agenda yet English national identity has gone through the roof. More people in England identify with England rather than Britain than the other way round, 17% of people consider themselves English but not British but only 7% consider themselves British and not English. The number of people who consider themselves English to some extent is overwhelming. 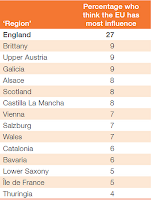 English national identity is the third strongest "regional" identity in the EU. Scotland tops the table, unsurprisingly, followed by Catalonia (no surprise there) and fourth place goes to Wales. Despite the persistent campaign of denigrating the English identity by the British government, the BBC, the left wing press and others, there is an overwhelming sense of pride in being English. A similar proportion of English people feel proud of being British as being English but that pride is less equivocal with more people being "very proud" to be English compared to "fairly proud" to be British. 48% are very proud to be English and 31% are fairly proud. 38% are very proud to be British whilst 39% are fairly proud. More people are proud to be English than British. Similar to the national identity question above, the degree of attachment to England is higher than to the UK. English people are less equivocal about attachment to England than they were in the national identity question with a very similar proportion of people "very attached" and "fairly attached" but combined they show that 85% of English people feel an attachment to England against 76% for the UK. An overwhelming number of people think St George's Day should be a public holiday. 74% of people agree strongly or tend to disagree, only 12% disagree - 1% less than "don't know". A 2009 Freedom of Information request found that the British government has spent just £230 in five years on promoting St George's Day, including the £114 cost of a flag to fly once a year over the Department for Culture, Media and Sport's offices - a British government department with an English-only remit. More money is spent by the British government promoting St Patrick's Day than St George's Day. The report helpfully lists the responses of non-white English people to their national identity. The number of non-white people describing themselves as "English not British" has gone from 1% in 2007 to 9%. 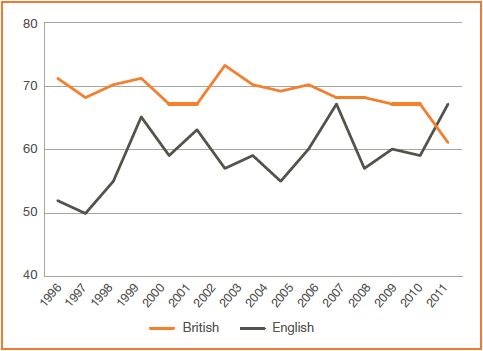 The number describing themselves as more English than British has gone from 3% in 2007 to 13%. 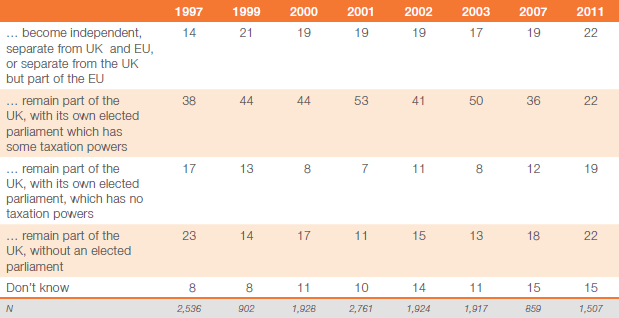 The number describing themselves as equally English and British has gone up from 18% in 2007 to 23%. The number identifying themselves as more British than English or only British has declined, as has the number identifying themselves as something other than English or British. More on this shortly. When asked which party best stands up for English interests, the majority said none. Bizarrely, the Labour Party which introduced devolution for Scotland, Wales and NI but refused to do so for England and installed a Scottish MP as Prime Minister who presided over a number of controversial English-only laws that no English person could judge him on at the ballot box, came top with 21%. The Conservatives, whose leader proudly boasts of the Scottish blood coursing through his veins, who has gone to Scotland a number of times to slag off the English and who has said more than once that he doesn't want to be Prime Minister of England, came second with 20%. UKIP came third with 9% of people thinking that we would best represent England interests. More people thought that British National Party would represent England's interests better than the English Democrats - a damning indictment of that party's failed leadership that they come bottom of a poll of political parties that would best serve English interests when that was the sole reason for the party being set up in the first place. It is interesting to note the year the decline started. 2007 is the year the Scottish MP, Gordon Brown, was installed as the heir of Blair and the agressive promotion of Britishness started in earnest. The increase in sense of Englishness might be a reaction to the enforced Britishness agenda, it might be a reaction to a Prime Minister elected in Scotland who is unaccountable to the voters whose lives he most influenced, it might be a reaction to the increasing rights and privileges of the Scots and Welsh or it might just be a natural phenomenen. My money is on all of them combined and any number of other factors but it's not important, the shift in the national psyche has already happened and what needs to happen now is for the political establishment to catch up with the views of those they are supposed to represent. It is interesting that there is a large increase in the proprtion of non-white people identifying themselves as English. Minorities in England are encouraged to be British, their interaction with the state from day one is with all things British. In Scotland a newly-arrived immigrant's interaction will be mostly in a Scottish context. The British government encourages immigrants to be British (in a half-hearted manner) whereas in Scotland they are encouraged to be Scottish not just by the Scottish government but by their Scottish peers. By encouraging immigrants to identify with the British identity, the British government are creating a barrier to integration and simply replacing one minority identity with another one. The message coming out of the IPPR report is that the English identity has finally replaced British as the dominant identity in England, that Englishness is rapidly gaining and as yet unrealised political aspect and that the English are dissatisfied with the way their country is governed. The IPPR report would seem to suggest, based on one set of figures, that most English people want the constitutional fudge most commonly known as English Votes on English Laws to replace the current situation where British MPs from all four member states of the UK vote on laws only affecting England. This is more or less what UKIP's current/outgoing policy is. However, as I pointed out above, the question - Now that Scotland has its own parliament, Scottish MPs should not be allowed to vote in the House of Commons on laws that only affect England - doesn't actually ask for opinions on English Votes for English Laws, it asks whether Scottish MPs should be banned from voting on English laws which also encompasses an English Parliament, independence and regionalisation. The number of people who came out in favour of banning Scottish MPs from voting on English laws is almost exactly the same as the combined support for an English Parliament, English Votes on English Laws and regionalisation. You have to look further down the report to find a more relevant measure of support for a particular form of government in the question of who should have most influence over decision making in England where the majority were in favour of a devolved English Parliament. The British government will surely have to take notice of this report, the likes of which they have been diligently avoiding commissioning themselves. The results are unequivocal and the conclusions are pretty damning. It shows that UKIP has been on the wrong track opposing devolution but also shows that we are once again ahead of the curve as the first mainstream party to come out in favour of an English Parliament to balance the assymetrical devolution already in place.